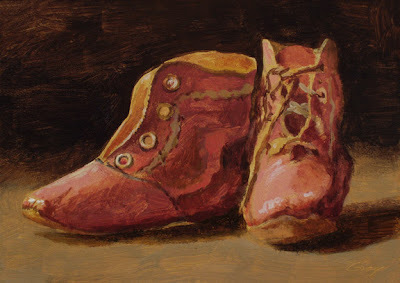 Another pair of antique baby shoes from the museum's collection. I noticed after I began painting that I had reversed the shoes. Remember doing that as a child--getting your shoes on the "wrong" feet? Doggone it, you really found a treasure chest. And, you are making good use of it. Lovely piece. Yes Don, I also remember going to work in one black shoe and one brown shoe and I was quite a grown up lady by then. A wonderful series Don. Thanks, Bill--I appreciate your note. Ha, Sheila, I think my wife did the same thing once. And I walked around one day with an Adidas on one foot and a Nike on the other...at least they were both white! Thanks for the comment. And when I was told I had my shoes on the wrong feet, I replied, "But these are the only feet I have." I don't remember this, but my mother told the story many times. I love that story, Carolyn. I've heard variations on it too. Thanks for the visit.